Aztecs made use of various designs in their warrior drawings, paintings and the pictographs which often adorned the walls of their temples. These designs were often meant to make the gods happy. Different designs were tattooed on the Aztec warriors, often depicting their accomplishments or depicting one of the many Aztec gods. In earlier Aztec designs, geometric designs painted in different colours have been found. Later Aztec vessels, found by archaeologists, reveal that the Aztec were more inclined to paint plants and animals in the later period. Geometry and symmetry played a major role in Aztec designs. An example of this is the Calendar Stone which makes use of a geometrical symmetry in a circular structure to show the reign of Five Sun Gods. Aztec design took influences from a variety of other cultures. In the Valley of Mexico, where the Aztec Empire was born, tribes from the north of Mexico had been coming and settling since the 6th century. Each of them brought a different culture imbued with different experiences. The Aztec designs were a result of a mixture of all these cultures. A major influence was that of the Toltecs, a people in Mesoamerica who had a very rich culture which perished in the 12th century. The Aztec considered the Toltecs to be the most civilised people and borrowed many aspects of their culture. 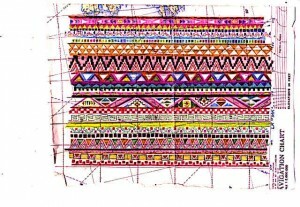 Aztec made use of number of styles and patterns in their artistic designs. Some of these designs made use of geometrical objects, symmetrically brought together in long lines. 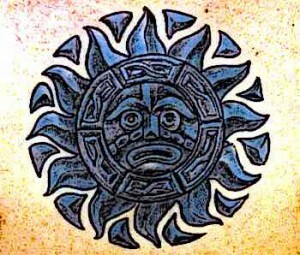 An example of this is the Sun Stone, in which Aztec mythological concept of the Five Suns is depicted in a circular pattern with remarkable symmetry. The designs of the Aztecs were often circular or rectangular, the patterns usually made use of recurring geometric symbols while the type was nearly always religious, or having a connection to the Mayans gods. Aztec made use of a number of design materials. They would make their designs on different materials such as pearls, jade, shells and obsidian. The aim of painting precious materials with religious symbols or designs was to please the gods. Among the commonly used design colours by the Aztec, turquoise was the most popular. It was used in creating mosaics over sculptures as well masks. Other than turquoise, Aztec made use of many bright colours to adorn their designs. The designs applied to clothes, mosaics and other sculptures were commonly done in very bright colours and often, the brightness of the colours also differentiated a rich man’s clothing from that of a slave who wore uncoloured clothes. Aztec design artists were typically persons who were commissioned either by the state or the rich nobility to create pieces of art. Lower classes were forbidden to either create or own art, so the creation of art was regulated by the richer classes. The Aztec artists were called “tolteca” which meant skilled craftsmen. The artists were esteemed and richly rewarded for their work. Some artists, skilled in arts not practised within the Aztec Empire, were called from other states to work in the city of Tenochtitlan. Aztec artists made use of different tools to create the designs which then ornamented head-ornaments, walls of the temples, small statues and objects meant to appease the gods. Feather-workers created designs in feather-mosaics and were an indigenous form of artists in the Aztec Empire. Aztec pictures include complex geometrical designs alongside the pictures of different animals such as jaguar, fish, birds, snakes and monkeys. Most of the animals used in Aztec pictures are related to their belief system and symbolised something of a belief. Aztec created free-standing sculptures as well as reliefs carved into temple walls. Some of these sculptures denoted gods while others, such as small carved objects, were used to depict animals and humans. The Calendar stone, or the stone of Five Suns, is the most popular Aztec sculpture to have survived through the ages. The sculpture has a circular, geometric design and depicts the Five Sun Gods of the Aztec mythology. Aztec architecture made extensive use of proportion and craftsmanship. They built their houses and temples with specific architectural designs in mind. The houses, for example, were built like mountains in order to guard them from rain. The city of Tenochtitlan, the heart of the Aztec Empire, was itself an architectural wonder proportionately divided into four parts. The greatest temple within the city, Templo Mayor, was a huge temple with two staircases leading to the temples of two gods at the top and rose to a height of 50 meters. Aztec clothing designs were very significant in that they defined the social status of the wearer. Slaves, for instance, wore clothes with no adornment of colour. The richer an Aztec was, the more brightly his clothes were dyed and the better adorned they were. Aztec strove to have bright-coloured designs made on their clothes and this was considered a status symbol. Moreover, complicated designs were preferred for the adornment of Aztec clothes. Aztec designs are indicative of a culture very rich and with a very creative mythology. The Aztec Empire itself was a conglomeration of different tribes which had settled in Valley of Mexico. So the Aztec civilisation combines different aspects of all of these tribes. Moreover, once the Empire began expanding, it accepted influences from other people and city-states it came into contact with. The nature and the application of most designs, in painting and sculpting, were specific to the gods and meant as a tribute to them. In architecture, as in their painted designs, the Aztecs were very keen on symmetry and proportion, going to great lengths to ensure symmetry between different parts of a temple or a city. The colours used to adorn these design were very bright and Aztec seemed to value bright colours very highly.